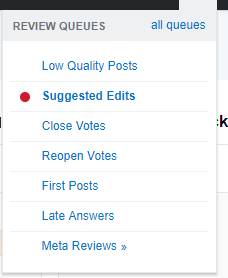 I just saw a red dot on the Suggested Edits queue and so checked it - there were two edits pending review in the queue. But I am still seeing the red dot now even though the queue is empty. Has anyone else had this? Is this a bug? I believe the red dot is based on the total number of reviewable items in the queue, while the review pages show the number that are reviewable by you. The review icon (dot or not) appears on every pageload by every user with review privileges, so a simpler and cache-able database query speeds up the site. In your case, suggested edits need approvals from two users. If you went through the queue and provided the first vote on every item, then there are no more tasks in that queue for you. But the queue is not empty, so everyone still sees the red dot --- you included. If you went through and provided the second vote, so that the queue was really cleared, then caching might keep the dot around for a few minutes anyway. Is there an automatic upvote for all questions with the tag “9th planet”? Or possibly a bug? What happened to my profile on this site?